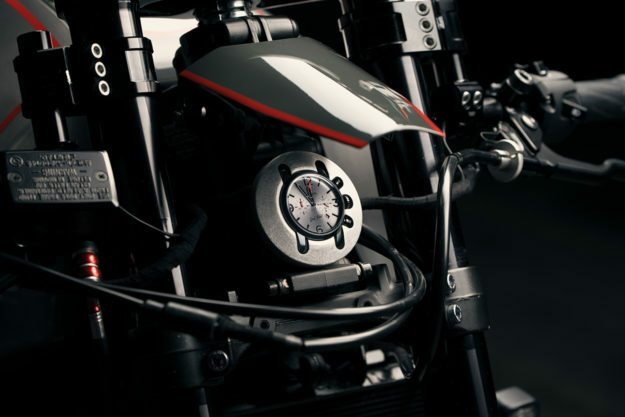 Motorcycle styling, even in the custom scene, tends to edge forward in increments. Bikes fit neatly within genres, perhaps stretching the envelope in one direction but playing safe in others. But occasionally someone will try something completely new. 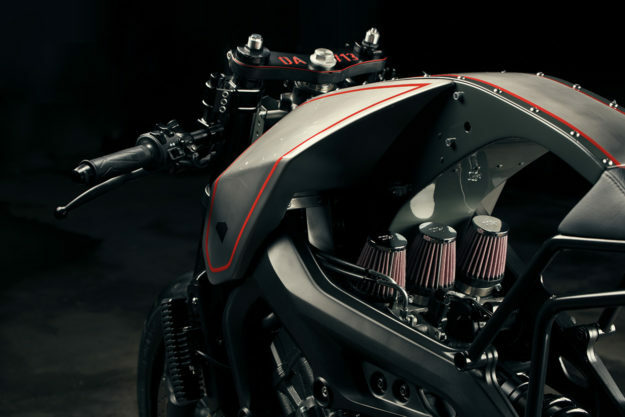 And so it is with this groundbreaking design from Diamond Atelier, the Munich workshop famous for its immaculate BMW airhead customs. 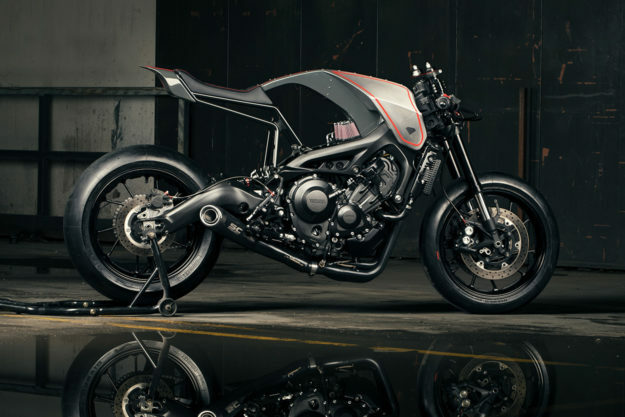 It’s a Yamaha XSR900 built for the Dutch watchmaker TW Steel and called ‘Æon.’ And yes, there’s a huge gap where you’d normally expect to see a tank. There’s definitely a skeletal look to Æon, with the engine exposed—in much the same way as the mechanism of a mechanical watch might be revealed. 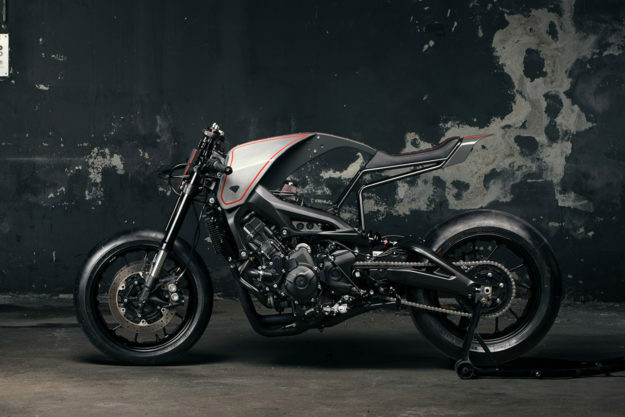 The design comes from Diamond Atelier collaborator Julian Weber, and is influenced by current custom car trends in Japan. The build schedule was tight, so KRT Framework were trusted to fabricate the bodywork. “Marvin Diehl faced the challenge and knocked out the design from aluminum in no time,” says Tom. Hidden under a flip-up panel where the headlight would normally be is a TW Steel timepiece. 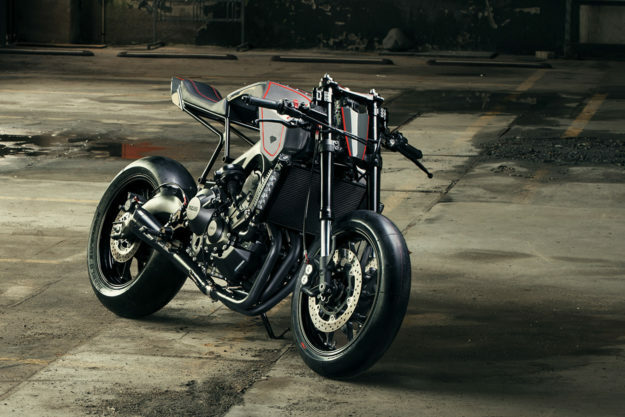 The rest of the build was simpler, with parts selected to suit the urban yet lightweight look of the XSR900. Up front, Tom and his partner Pablo Steigleder have installed black ABM Multiclip handlebars and lowered the anodized forks. 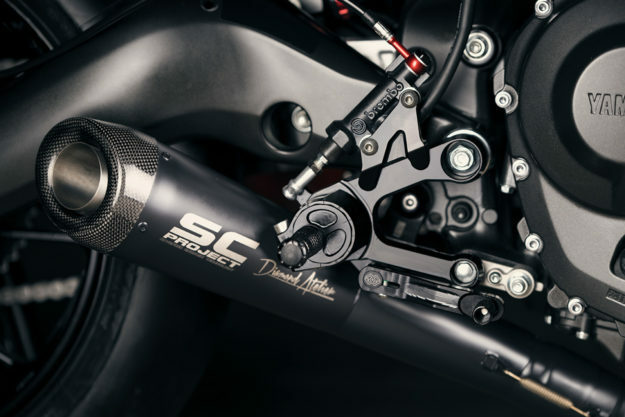 They’ve also fitted Gilles rearsets and a color-matched Wilbers Blackline rear shock. 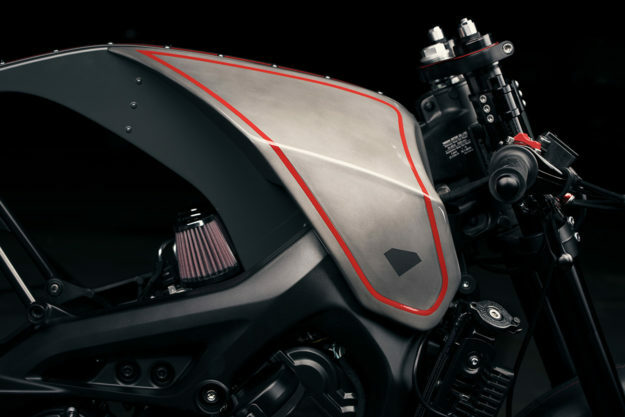 Extending the monochrome color scheme are ABM steel braided brake lines, and the (already exceptional) handling of the XSR gets a boost from Pirelli slicks. 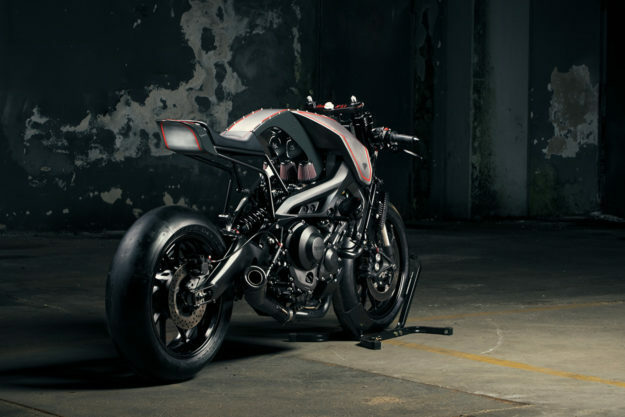 The engine is the XSR900’s great strength, so Diamond Atelier have just tickled it lightly with a set of K&N filters and a one-off SC Project exhaust system. “The trickiest part was handling the electronics,” Tom reveals. “We needed to cut down the harness to the absolute minimum to make it fit underneath the new bodywork.” There’s an incredible 100 meters (328 feet) less wiring compared to stock, but all the major functions still work—except for the ABS, which had to be sacrificed. Juice now comes from a pair of lithium ion batteries, with Kellerman indicators and LED lighting front and back. 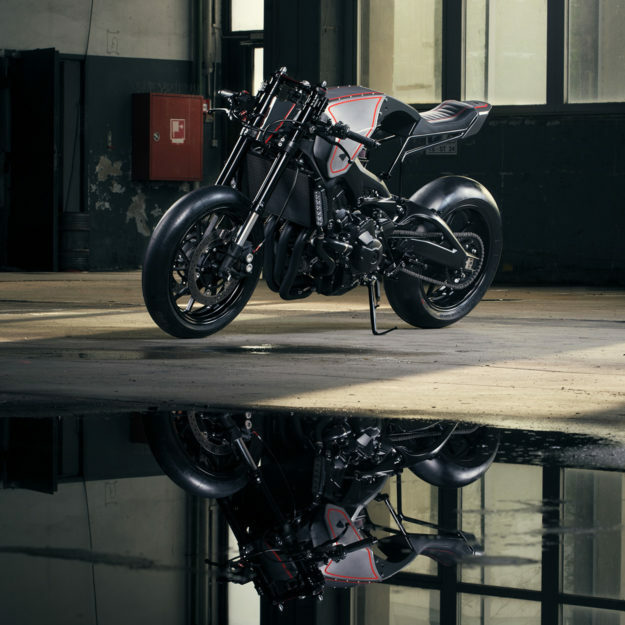 Æon is one of the boldest approaches to custom styling we’ve seen in recent years, and sure to polarize opinions. It’s a styling exercise, and Diamond Atelier make no apology for that. “The fuel tank holds around three liters, which should be enough to get from one gas station to the next!” Tom laughs. But there are some very interesting ideas here, which may filter into future bikes—albeit in a more practical form. Kudos to TW Steel for giving one of Europe’s top builders a free pass to stretch the envelope to the absolute limit.